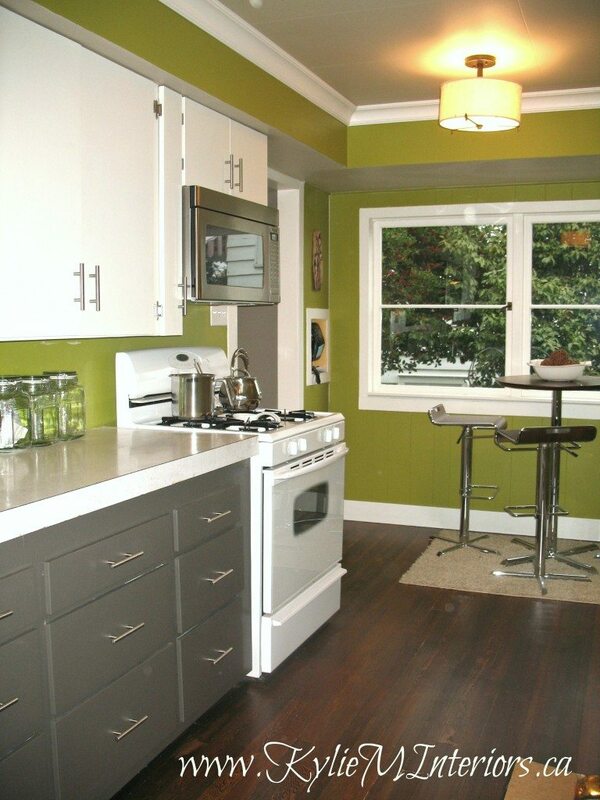 This old kitchen was in need of some serious funky love – on a budget! Kitchen remodels can get out of hand very quickly when your space is completely outdated – and this one certainly was! So, to keep our budget in-line while still creating an UBER-fab space, we focused our efforts and funds on updating and refreshing with paint! Amazingly enough, the original countertops were in great shape and were neutral enough to keep, they also had a fabulously thick 2″+ profile which I was madly in love with. Along with painting the nasty ole’ cupboards, we also refinished the original fir floors in a dark stain and added a funky green wall colour to jazz things up a bit! This wretched ole gal was in need of some serious KLC! The sleek and modern hardware helped to jazz things up a bit and added some bling! I also got to have some WICKED fun decorating the bookshelves with kitchen-friendly accessories that were hiding in the cupboards – I just love when I get free-rein! Want some budget-friendly and fun ideas for your home? Check out my affordable Online Colour Consulting and Virtual Design Services! I love these colors in this kitchen. In fact, my chosen colors for my new house will use them…..I have chosen Kendall Charcoal for one of my rooms and I’m also going to have a 2 toned kitchen…with Black (or deeper dark charcoal) on the bottom and white on the top..my house is open in all the public rooms, so I have also used a very similar green, Behr’s Retro Avocado. Anyway, I’m a bit confused cuz you list the colors used and you say it is BM Kendall Charcoal…BUT, when you SAVE the pic to a file… it says it is Amherst Gray.. which is BM HC 167. Kendall Charcoal is HC 166 and the often used and equally popular Chelsea Gray is HC 168. Would you mind letting me know which one you actually used? Also, did you also use the same Gray in the room just outside that doorway that is showing in the pic? Anyway, it looks nice. I think it helps to see it.. because I’m also thinking of using a very dark Navy for the bottom cabs. Any faves? Eileen (how will I know if you do? Keep checking in here.. this is an old post? If you decide to go for a darker navy – almost black on the bottoms, Abyss is a beautiful ‘almost black’ navy blue. But if it were myself, I’d worry about the lifetime and flexibility of it – whereas Kendall Charcoal will keep going and going. At one point I painted my end dining room wall a navy blue and in the right light I’d just had a wee wee smidge of green in it (very very…very subtle). It was Black Knight by Sherwin Williams and really quite beautiful – and then I got bored as usual and painted it a rust colour! I had it paired with my Gentle Cream walls and my Chelsea Gray kitchen cabinets and it was gorgeous… http://www.kylieminteriors.ca/painting-a-feature-wall/ I do think it would be too light for cabinets, but maybe it’s a consideration for accents around the room? As for the colour outside the doorway, that’s actually the start of some more cabinets that were painted and I believe we did those ones Kingsport Gray for a softer look. So, now that I’m replying in my sane mind, let me know what you think!! I’m also going to trs Eileen!